I saw this really cute idea on Pinterest that I thought might help us bond more as a family instead of waving at each other in the hallways of our house. The photo very clearly showed that this item was not going to get hot. Shut up. You’re not the boss of me. And besides, I think that’s chemistry or something. I majored in biology. If you put flaming charcoal briquettes in a frog, I would totally be able to predict what would happen. So there we were, having a family moment. Well, three of us were. My husband is afraid of bugs and he refused to come outside, even while I was roasting marshmallows in this handy dandy container and teaching them the words to “Cat’s in the Cradle.” We had a blast. Until this happened. 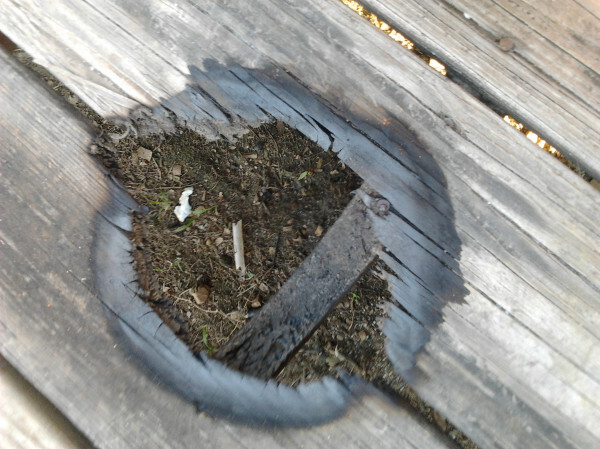 The best part of my husband’s stupid bug phobia is he still doesn’t know there’s a charred hole in our house. I paid a lot of money yesterday to have a little bit of wood delivered and I’m going to make this whole outdoor kid’s play thing that will cover up the hole. More family bonding, I get rid of the evidence, and then I’ll have something to post on Pinterest to sucker some other unsuspecting do-it-yourselfer into destroying her home. Win. Very funny! Absolutely something I would have done 🙂 Look closer at the photo — the pots are on a cement patio. Cheaters. What is the point of flaming tera cotta if there is no chance of burning the place down?? They are wimps, I say! You, my dear, are daring and live on the edge! Yeah! That’s it! That’s right…I’m not an idiot, I’m fearless! 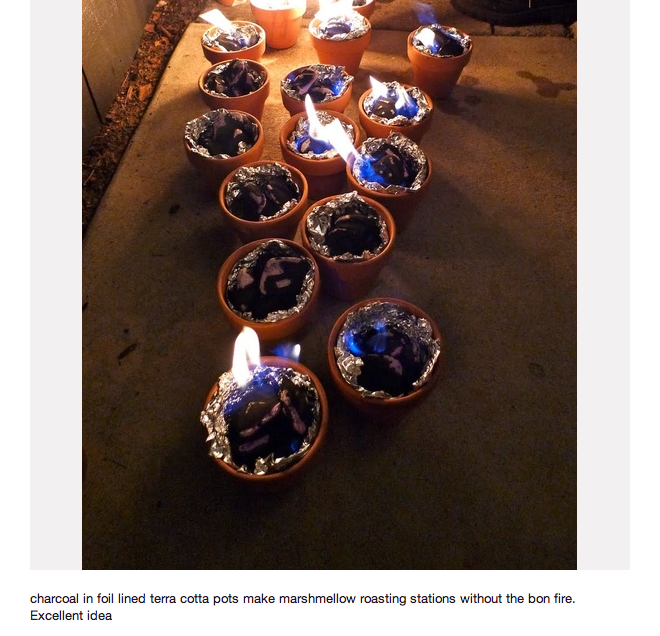 For the record, the photo I saw on there was of someone actually holding the pot while it flamed. Therefore, I just assumed it didn’t get hot. I don’t know, I’m willing to bet there are some authorities who would take away my matches! Let me show you a neat trick with flower pots and home-made thermite. Nah–just Google it. No, wait! You can’t leave me hanging like that!!! And if I Google it, the government’s gonna start watching me! But it wouldn’t have been NEARLY as funny! Of course, I’m talented enough to set the bricks on fire by mistake, too! Don’t do them! Whatever you do, DON’T! Except microwaving a bar of Ivory soap. That was really cool, and I did that even after burning my house. What happens why you microwave a bar of ivory soap?! Great post btw I think my ex husband would have been the one to try this and I would have blown up…but pinning is so fun even if you rarely attempt a pin. The soap is awesome. It MUST be Ivory. I put mine in a large glass pan and microwaved it for three minutes, stopping it whenever I felt like it. It turns into a massive cloud-shaped thing. I figured out the best thing is if you EVER need soap flakes for some reason (I don’t know why you would, but if you did) this is the absolute easiest way to do it because it literally crumbles in your hand. You. Are. A. Genius! Mwaahaahaa! That’ll teach ya! Never try anything you read about online. So far, we’re about 0 for 5 on things I saw on Pinterest. That sounds very male; did you accidentally eat a testosterone tablet? That’s the only way I can see a woman doing something so stupid only a man could do it and added to that you tried to hide it, which is very male. Opened my mouth and put my foot in it! I’m packed full of masculinity today. I’ll do the feminine thing and apologize sincerely. (Hey I’m communicating meaningfully… don’t tell the lads). Your very sincere and kind apology just cost you your Man Card. I’M DYING HERE! This was hilarious! It’s because the pot had a hole at the bottom right? If there wasn’t a hole, this would never have happened, I’m sure of it! No, I’m pretty sure that any time someone hands me any kind of fire, this is going to happen. But thanks for stating that it wasn’t my fault! How did the marshmallows turn out? Maybe you could just use fewer briquettes? I thought the home made “green egg” was awesome…well till I saw the hole. Hysterical. The marshmallows, for the record, were awesome. Would ya just go on and get your damn late night comedy show already? You could be billed as Ellen, with zip. Thanks! I do really wish that I was just funny and not simply reporting the facts from my own life.